Specially sized just for this kind of duty is this Scarf Clothes Hanger For Eagles Football concept. Here hung from an upright, these scarf hangers could just as easily hang from a horizontal rail, and merchandise multiple teams and sports franchises. Buy the scarf and get the custom scarf hanger for use at home. A good deal. 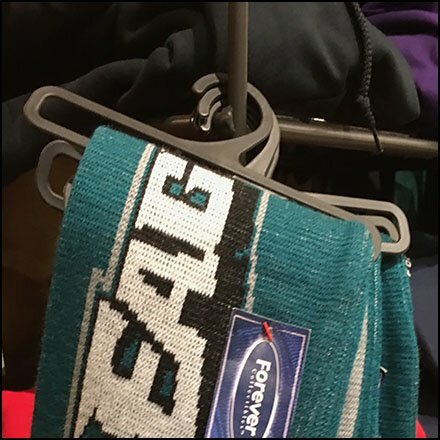 This Scarf Clothes Hanger For Eagles Football concept seen at Wegmans, Allentown PA.